Rane and Serato are pleased to release the Rane SL 2 for Serato Scratch Live: a compact, professional two-deck interface packed with creative features to give DJs a competitive edge. Professionals and budding enthusiasts alike will appreciate the streamlined design of the SL 2, the most portable in the series of Scratch Live interfaces, with two inputs, two outputs and a high-speed, low latency USB 2.0 connection. 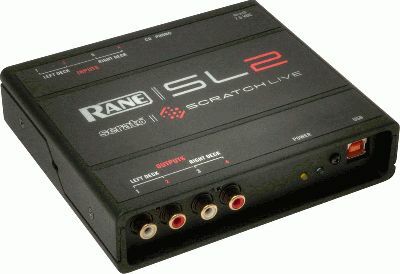 Rane’s trademark sonic qualities resonate in the SL 2 with 48 kHz, 24 bit audio processing. Plus studio grade phono preamps produce a vivid, dynamic sound for any performance. ASIO and Core Audio drivers transform the SL 2 into a premium studio production tool, and galvanic isolation ensures crisp, clear, interference-free signal. “The SL 2 is destined to be a modern day classic,” says Sam Gribben, General Manager of Serato Audio Research, “it has the simplicity of a traditional two deck DJ setup, but the flexibility to add samples and effects to the mix. The SL 2 may be small, but it packs a massive punch". The Rane SL 2 comes complete with Serato Scratch Live, the world’s leading DJ software; offering a fully-featured arsenal of creative DJ tools including cue points, loops, the SP-6 sample player and powerful DJ-FX. DJs will experience the tightest, most authentic vinyl feel, thanks to Scratch Live control vinyl and CDs, which are pressed with a proprietary non-timecode-based Serato NoiseMap™ control tone. This specially designed tone delivers amazing response at both very high and very slow speeds, for unparalleled sensitivity and responsiveness. Hardware by Rane. Software by Serato. The crowd is yours. The Rane SL 2 ships in April 2011. US MSRP $629. · Inputs for two turntables or CD decks and software THRUs for quick connection. · Studio-grade phono preamps and 24-bit audio processing for superior sound quality. · The most authentic vinyl feel, due to Scratch Live’s non-timecode-based control tone, which utilizes Serato’s unique NoiseMap™ technology. · Built-in galvanic isolation to eliminate computer noise and interference. · Compact and ultra rugged hardware for portability and simple setup. · ASIO and Core Audio Drivers for studio production with third-party software. · Support for The Bridge* with Ableton Live and compatibility for video mixing with Video-SL**.